Tuna Whole Meat, Water Sufficient For Processing Balance, Tilapia, Potato Starch, Sunflower Seed Oil, Dicalcium Phosphate, Xanthan Gum, Choline Chloride, Taurine, Vitamin E Supplement, Zinc Sulfate, Thiamine Mononitrate (Vitamin B1), Nicotinic Acid (Vitamin B3), Ferrous Sulfate, Calcium Pantothenate, Vitamin A Supplement, Potassium Iodide, Manganese Sulfate, Vitamin D3 Supplement, Copper Sulfate, Riboflavin Supplement (Vitamin B2), Pyridoxine Hydrochloride (Vitamin B6), Folic Acid, Menadione Sodium Bisulfite Complex (Source of Vitamin K), Vitamin B12 Supplement.
" Crude Protein (min) 12%, Crude Fat (min) 1.5%, Crude Fiber (max) 1.0%, Moisture (max) 84%, Ash (max) 1.5%, Taurine (min) 0.05%, Calcium (max) 0.25%, Magnesium (max) 0.008%, Phosphorus (max) 0.19% "
After ordering many products and doing extensive cat care research have found that for the price, quality, and nutritional value there are 3 brands and a variety of 'flavors', that are the best on the market and are offered at a great price here at K9 Natural Supplies. After performing the calculations and ordering a variety of canned food from K9 have found that Tiki, Earthborn, and Weruva have the best guaranteed analysis, with the highest protein and the lowest carbs while maintaining a grain-free, holistic approach to cat food with their ingredients being human grade with real meat, no by-products, and no preservatives. Tiki's Hawaiian Grill & Lanai Luau are the best of Tiki's flavors and have the highest concentrations of protein at 15% and NO carbs. Earthborn's Catalina Catch also has NO carbs and is high in protein at 14%. 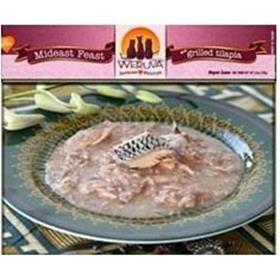 Weruva's Mideast Feast and Meow Luau both offer high protein, 12%, while retaining NO carbs. Weruva and Tiki offer the best variety with NO patte canned food, all real and whole, and both brands other flavors, besides those previously mentioned, are comparable and still healthy with minimal carbs, UNDER 4% which is nominal and the best for cats. For cats, the higher the protein and fat and the lower the carbs, the better. However, 9 Lives Tuna Select and Tuna and Egg are the best thing next to raw with NO carbs and over 16% protein. Mind the bones, though digestible and a great source of calcium, large bones should be removed or cut up. If you want to perform your own check for carb counts in your kitty's food simply add the protein, moisture, fiber, fat, and ash, then subtract 100 or from 100 and then divide by 0.25, this is your percent of carbs and should be under 4. For example, Weruva's Mediterranean Harvest has 12% protein, 1.5% fat, 0.5% fiber, 84% moisture, and 1.5% ash, this totals 99.5%, from 100, 0.5 remains, 0.5 divided by .25 is 2. This is your carb percent, 2. Real human quality food and smell, my cats lap it up! Small convenient portions to add variety to their day. Healthy, palatable, and moisture rich!